Forecasters overnight declared a winter storm warning for most of southeastern Pennsylvania ahead of a nor'easter expected to move into the region Tuesday night. The warning is in effect from 7 p.m. to 3 a.m. Thursday for Philadelphia and its northern and western suburbs. 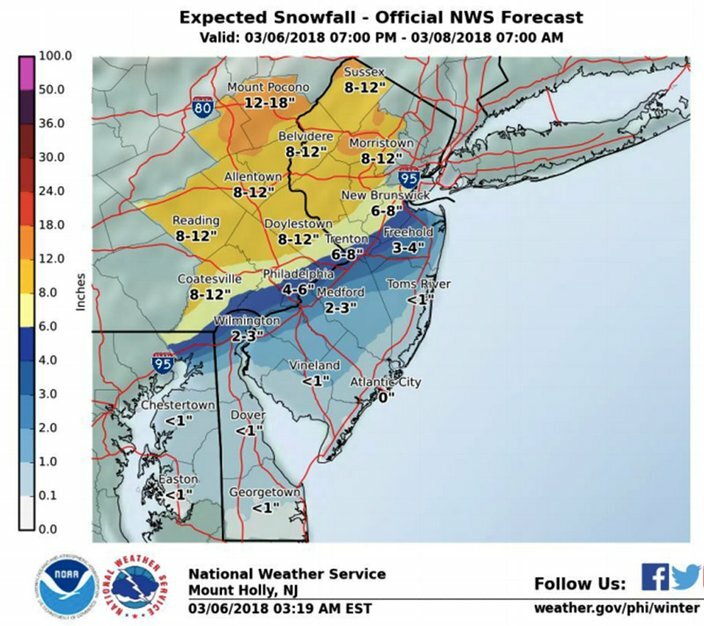 South Jersey remains under a winter storm watch, but could still be elevated to a warning, the National Weather Service said. The effects of the storm, which will be the second nor'easter to hit the area in five days, could begin to be felt as early as Tuesday's evening rush hour as rain. Later, it will turn to a mix of rain and snow, before turning to all heavy, wet snow overnight Wednesday. Downed trees and power lines, along with additional power outages, are possible. Travel will be difficult, if not impossible, especially for the Wednesday night commute, when the snow could fall at a rate of 1-2 inches an hour. Philadelphians can expect from 4-6 inches of snow, forecasters said. Parts of the northern and western suburbs could see as much as 12 inches of snow. 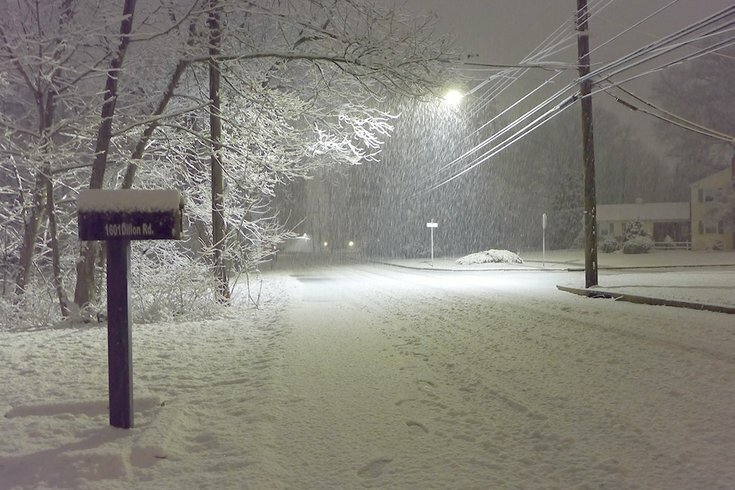 In the southern Poconos and northwest New Jersey, from 12 to 18 inches of snow is expected. Six inches or less is likely in South Jersey, and the southernmost points, including Cape May, may only see rain. Sustained wind speeds increasing to 15 to 20 mph with gusts up to 30 mph probable. Locally minor coastal flooding is possible, mainly along the northern and central parts of the New Jerseycoast. Gale force winds and rough seas on the coastal waters of New Jersey and Delaware, and on Delaware Bay. Near storm force wind gusts are possible. The region is still recovering from a nor'easter that struck Friday and Saturday with snow and strong winds, toppling thousands of trees and bringing down electrical lines. More than 26,000 PECO customers are still without power early Tuesday morning. The wind coming with Tuesday night's storm is expected to be strong, but not as powerful as the earlier storm. Looking ahead, another area of low pressure is forecast to move eastward to the Middle Atlantic coast on Sunday, forecasters said. Another round of precipitation is possible, with rain and snow possible in the Philadelphia area. Tuesday: A chance of rain, mainly after 5 p.m. Increasing clouds, with a high near 46. Light and variable wind becoming southeast 5 to 7 mph in the afternoon. Chance of precipitation is 30 percent. New precipitation amounts of less than a tenth of an inch possible. Tuesday night: Rain and snow, becoming all snow after 5 a.m. Low around 33. East wind 7 to 9 mph. Chance of precipitation is 80 percent. New snow accumulation of less than one inch possible. Wednesday: Snow and sleet before 7 a.m, then rain, snow and sleet. High near 38. East wind 11 to 16 mph becoming north in the afternoon. Chance of precipitation is 100 percent. New snow and sleet accumulation of less than one inch possible. Wednesday night: A chance of snow, mainly before midnight. Cloudy, then gradually becoming partly cloudy, with a low around 32. West wind 11 to 17 mph. Chance of precipitation is 40 percent. New snow accumulation of less than a half inch possible. Thursday: Partly sunny, with a high near 44. West wind 13 to 15 mph. Friday: Partly sunny, with a high near 43. Friday night: Partly cloudy, with a low around 28. Sunday: A chance of rain. Partly sunny, with a high near 46. Chance of precipitation is 30 percent. Sunday night: A chance of rain and snow. Mostly cloudy, with a low around 34. Chance of precipitation is 40 percent. Monday: A chance of rain and snow. Mostly cloudy, with a high near 45. Chance of precipitation is 40 percent.